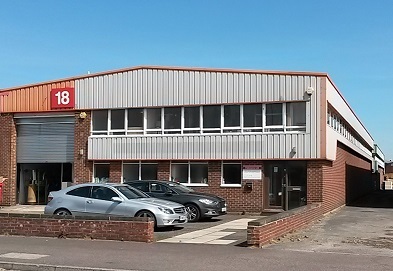 Fabmania is based in Leicestershire. 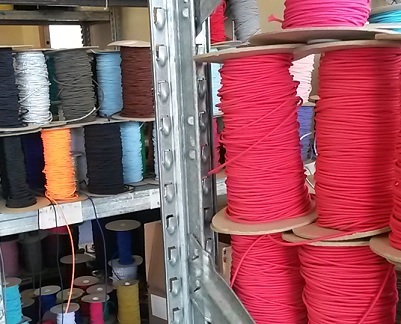 Here we make to order all types of cords, braid, boot laces, elastics, tapes and webbing. With 50 years of production expertise and over 100 production braiding machines and weaving looms at our disposal, we have the capacity and product range to manufacture virtually any type of narrow fabrics. Listed below are some of our main production ranges. For more information email us or phone on 01530 249553. We have a full range of modern braiding machines for making fine round cords on small 8 spindle machines through to 41 and 48 spindle machines making 30mm wide flat braids. Various special machines also make ric rac braid and insertion piping. With around 500 established styles which cover virtually every possible braid design, and with a standard stock colour range of of over 100 pre-dyed yarns, we can produce almost all orders on short lead times. 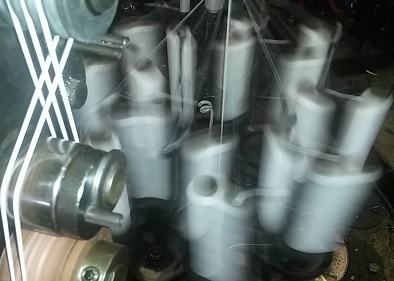 Orders can be fulfilled with the product supplied on reels, or cold cut lengths, heat cut to length or as shoelaces with acetate or metal ends. more details..
Fabmania is the largest manufacturer of shoelaces in the U.K, with a range of over 500 established lace styles, each of which can be made in many yarn types including polyester, cotton, nylon, Kevlar and acrylic. 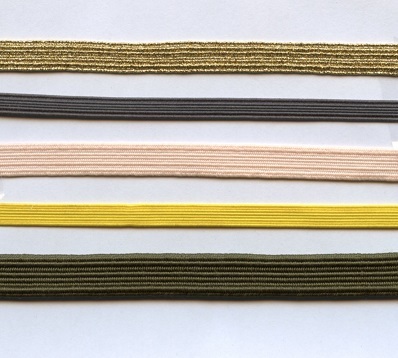 Most styles of shoelaces are offered in multiple choices of colour and the shoelaces can be made any length from 30 cm and upwards. Customers can choose a completely bespoke lace design with a minimum order of only 500 metres, or you can select from one of our many stock ranges which cover most popular requirements. Whether made to order or chosen from our stock ranges, the shoelaces can be processed at the customers required length(s). 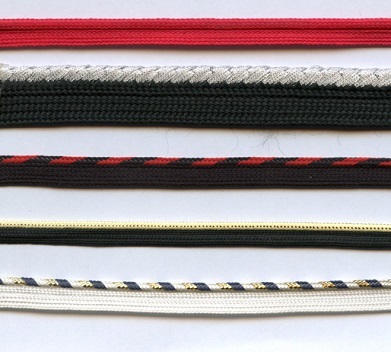 We offer a banding service where laces can be supplied banded as a pair of laces for retail sale. With in-house label printing facilities, the design of the label can be produced to the customers own design / logo requirements. 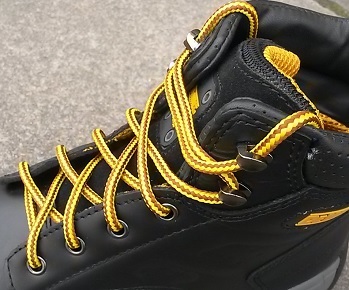 From short thin shoelaces through to super wide, extra-long, flameproof, high tensile strength boot laces, we make the lot! The term grosgrain tape describes quite a wide variety styles. 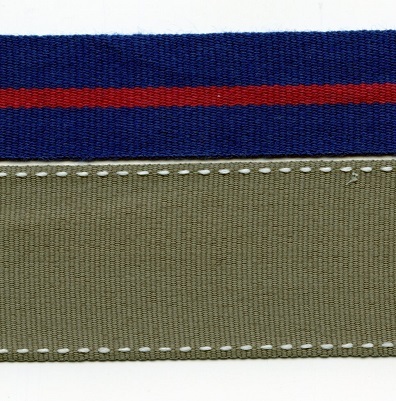 Essentially grosgrain is a simple weaving pattern which creates a lined or ribbed effect across the width of the product. Grosgrain tape can be anything from a lightweight ribbon though to webbing suitable for belting. Fabmania only manufacture woven grosgrain tapes to order as there are so many possible choices, our width range is from 6mm to 100mm, offered in a range of around 60 standard yarn colours. The tape can be a plain single colour or can be produced is a whole range of various patterns such as stripes, stab stitch etc. Our minimum order quantity is typically 1,000 metres and our lead times are usually 1 to 2 weeks. more details..
We manufacture a range of woven elastic tape and webbing products for use in aircraft interiors. These elastics are manufactured to meet the stringent standards of civil aviation authorities. Products are supplied with Certificates of Conformity and laboratory test reports (tested to CAA/FAR/JAR/CS 25.853A) carried out with a 15 second vertical burn test under specified temperature and humidity conditions. Our most widely used product is article M1530, a woven elastic webbing specified by B/E Aerospace and others for use as aircraft seat cover strapping. Also available are ranges of cotton and nylon rigid (non-elastic) tapes along with a range of round elastic cords in 3, 4 and 5 mm diameters made to the same exacting standards. more details..
Herringbone tape is a weaving pattern which makes a chevron or V shaped pattern across the width of the product. On wider widths the V can be a single chevron or repeated. 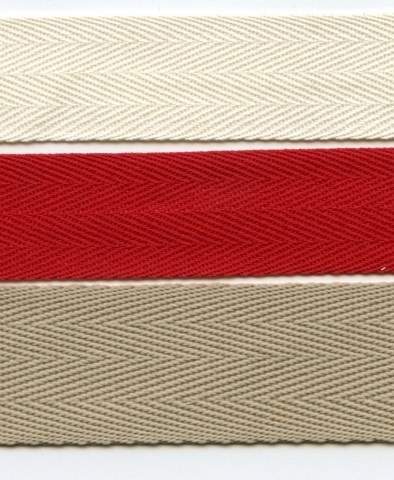 M880 which is a popular lightweight polyester twill tape (pictured in red) which finds applications such as apron string ties and M1498 (pictured in cream) which is a little thicker and with the chevrons more visible used in conservatory window blinds etc. Our herringbone tapes can be produced using polyester, cotton, acrylic and Lurex yarns. They are made to order in any width from around 6 mm to 100 mm. The minimum order quantity is usually 1,000 metres. We hold stocks of 25 mm and 12 mm polyester herringbone tapes in white, black, red and green more details. Round elastic cord is one of our main product lines. At our Loughborough factory we manufacture a range round elastic in diameters from 1.2 mm to 5 mm. 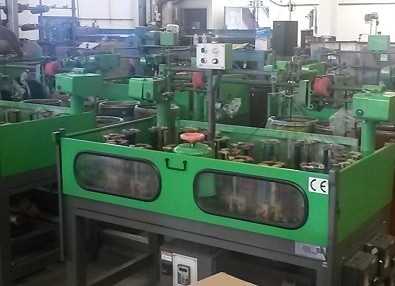 Having a large number of braiding machines for producing elastics, along with an extensive range of stock yarns means we can put any order for any size and colour combination into production quickly. usually within a day or so. The most popular yarn used in the manufacturing elastic cords is polyester. We carry a range of around 60 standard yarn shades. The cords can be made single colour, or can be produced in two or more colours with stripes, flecks or barbers pole patterns. The elastic can also be made using polypropylene, nylon and cotton yarns. More technical elastic cords are also made using materials such as Kevlar and Twaron for use where fire retardant properties are required. From stock we have a great range of round elastic cords in colours ranging in size from 2 mm to 5 mm. All the elastics are made using a core of natural rubber threads and textured polyester as the braided covering yarn. Both the rubber and polyester are purchased from OEKO accredited suppliers ensuring our products are suitable for use all applications from hobby crafts, toys etc. 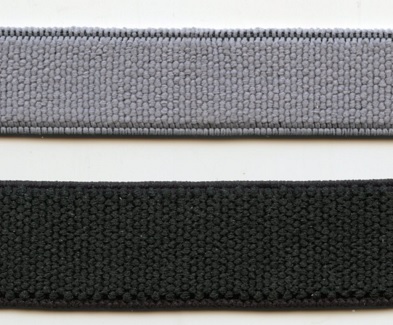 Flat braided elastic orders (sometimes called corded elastic) are made to order in a range of widths from around 5mm to 12mm width. The elastic can be made using a range of rubber thread diameters so that the end product can be as soft or as strong as required for the intended end use. The most popular yarn specified is polyester, viscose and metallic yarn options are also available. Insertion piping is a one piece narrow fabric trimming which has a bead and a foot or flange. Typically used in the seams of garments where the flange is sewn into the seam, leaving the bead visible as the trimming. Insertion piping is made to order only as there are so many possible designs and colour options. The yarns used in the manufacture can be polyester, viscose and lurex. The minimum order quantity is around 500 metres and a lead time of about one week.